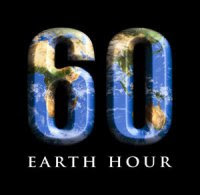 Earth Hour this Saturday night - is it all just a waste of time? It's the second annual Earth Hour this Saturday night and the wise cynics are once again gleefully reminding us how stupid we are to turn out our lights for one hour in the deluded belief that we're doing something about climate change. Homer takes Lisa to the Springfield Museum and sees the sign, `Suggested donation: $4.50'. Homer: Eh, what do you mean by `suggested donation'? Clerk: Pay any amount you wish, sir. Homer: And uh, what if I wish to pay ... zero? Clerk: That is up to you. Homer: Ooh, so it's up to me, is it? Homer: I see. And you think that people are going to pay you $4.50 even though they don't have to? Just out of the... ha ha... goodness of their... [laughs] Well, anything you say! Good luck, lady, you're gonna need it! Homer: No, no! It's a suggested donation. [whispers, smiling as if it's a great revelation] You don't have to pay! I don’t know if it’s widespread, but I often feel a lack of community in Sydney. And I think a sense of community is wonderful. Events like this connect us. If tens of thousands of people turn off their lights and TVs and sit out on their verandahs, or go for a walk and talk to some of the other tens of thousands of people doing the same thing, I reckon that’s great. Just have a look at some of the events people are organising! Climate change is often presented as a big problem with big solutions needed, to be provided by government and business. To a large extent it is. But there’s a lot that people can do about it themselves, in their households and as part of businesses and communities. When each of us does something personal about the issue, we’re reminded that this is something that we, personally, can influence. And I think that’s very positive and powerful. We don’t have to shake our heads and our fists at John Howard and George Bush, we can do a lot ourselves. Again, this might be an inner-city dweller neurosis, but I feel a disconnection with the real world living in the middle of Sydney. I get home, turn the lights on, turn the heater on in winter and have my own comfortable cocoon. We all rely on the environment for our health and wellbeing. But it’s easy to forget that. It will be nice to sit out on the balcony and look at the moon and listen to the breeze in the trees and watch the fruit bats fly past and think about the world. Maybe we’ll even be able to see the stars. As much as I love Iron Chef, it will be nice to have some quiet time to think and talk to Cat. Maybe we’ll have a candlelit dinner at one of the restaurants which are turning their lights off for Earth Hour. It’s easy for households to switch off lights and appliances during earth hour. It’s much harder for some businesses, despite the fact that at 7.30 on a Saturday night, many businesses aren’t open. This exercise has been a useful learning exercise for many businesses (including my workplace) that you can’t assume that everything is switched off on a Saturday night. (Have a look at office buildings in the city at night and be dazzled by all the empty offices with all their lights still on). They have had to put measures in place to achieve this and hopefully those measures will continue to bear fruit in terms of energy and emissions savings long after earth hour is over. I had a great Earth Hour last year - it was quite cool to see lights go out in so many other apartments. For the people who go through with their oh-so-rebellious, witty and contrarian 'Illumination Hour', although I mock them and they mock me, I genuinely hope they enjoy that too - at least we share the recognition that the issue deserves attention and that symbolism can be important. There's nothing wrong with celebrating electricity - go for it! - but I'll be reflecting on simpler things this Saturday night. I'd encourage you to be part of Earth Hour too. Why don't TV networks advertise their competitors' shows? Here's my random thought for today: why don't TV networks ever promote their competitor's shows? Now I'm sure you're thinking that's one of the most stupid ideas you've heard lately. And it probably is, but it's not quite as stupid as it sounds. The potential audience for any particular show is people who would otherwise watch another free or pay TV channel and people who otherwise wouldn't watch TV at that time at all. Consider a deal where two networks ran three ads for a show on the other network. If successful, they'd take viewers from each other - but they should roughly cancel each other out - and, importantly, they'd also take viewers from other networks not in on the deal as well as people who would otherwise wouldn't have watched TV at all on that timeslot. They should both win from such a deal. It should grow both their markets. So why do you think we don't we ever see it? Professor Ross Garnaut's blueprint for an Australian emissions trading scheme was released last Thursday (pdf). I haven't got past the exec summary yet, but Robert Merkel has an excellent discussion at Larvatus Prodeo today, and econobloggers Harry Clarke, Peter Martin and Joshua Gans had some thoughtful comments over the weekend. And it's received a lot of press over the past few days. The big issue appears to be whether to auction permits or hand them out to exsiting emitters. More on this from me later, but it seems the debate has finally moved beyond the myth coming from the electricity industry that they need to be issued with free permits or else electricity prices will rise, disproportionately hurting the poor who spend a greater proportion of their income on energy. Electricity prices will inevitably rise under an emissions trading scheme: to a large extent, that's the point. Giving handouts to existing generators in the hope that they pass some savings on to households and not just their shareholders is naive - particularly when their competitors (new entrants to the market) will have to buy permits on the open market. And it's not necessary: the best way to compensate poor households, surely, is to use the revenue gained from auctioning permits to target tax cuts at lower incomes. On that point, I notice that petrol producers have run the same line in recent days: petrol should be exempt from an emissions trading scheme because families are struggling enough with petrol prices already. Aside from the fact that these kind of suggestions wholly undermine the aim of a trading scheme, there's better ways to help out struggling families than subsidising their energy use. How about reducing their overall tax burden? They can spend their savings on petrol if they so desire but how about we leave it up to them what they spend it on, rather than what petrol or electricity companies think they should spend it all on (oddly enough, petrol and electricity)? Alright, that's a bit of an exaggeration, but a report very quietly released by the US EPA (there's remarkably little mainstream coverage of it) has found that if emissions were cut by 56% by 2050, US GDP would grow by 80% between now and then, compared to 81% if emissions were allowed to increase on a business-as-usual basis. And that comparison doesn't count the costs of allowing emissions to grow unabated. It seems to me that the US is in a unique position when it comes to fighting climate change: it's the only country where taking unilateral strong action would pay off for it. That's because its emissions are such a big chunk of the global total (more than a quarter) that it can have a real impact on its own - and it faces some big costs from climate change. So if any one country should be leading on this issue, it's the US. And yet, it's the country that up to now has done the most to delay a global solution to the problem. The EPA's analysis follows other analyses (eg, the Stern Review in the UK and recent McKinsey reports on the cost of abatement in Australia, the US, the UK and Germany) that show that strong action on climate change is compatible with strong economic growth and can be achieved at a more modest cost than is widely anticipated. Rudd's tax cuts - inflationary or illusory? Mark Davis has a nice piece in the Herald today questioning the angst expressed by so many people about Rudd's election promise to cut taxes in an inflationary environment. Davis points out that these announced tax 'cuts' (and the Howard government's cuts of the past few years) are not necessarily cuts at all: the stated amount of the cut is the predicted reduction in the amount of tax collected because of the change to tax rates, compared to what would have been collected if the change hadn't been made (not compared to what was collected last year). The upshot? A government can collect more income tax than the year before and still call it a tax cut - and everyone seems to buy it. So what about the proposition that the latest batch of tax cuts due this July and said to be "worth" $7.1 billion will fuel inflationary pressures? Taking Treasury's most recent forecasts, and using some back-of-the-envelope figuring, suggests that Canberra could collect about $4 billion more in personal tax next financial year compared to this year. by a little under 0.2 per cent of GDP. So while the Government has been defending the tax cuts with convoluted arguments such as their effect on boosting labour supply and on dampening wage demands, the simpler reality is they will not fuel demand excessively because they are not nearly as generous as the politicians would have you believe. Speaking of inflation and things macro, one thing that I don't think has received enough attention is the emissions trading scheme due to kick off in 2010. It will come too late to influence our current bout of inflation but, depending on its design, it could have significant macroeconomic consequences down the track. Can biofuels help reduce greenhouse emissions? The answer, from a recent CSIRO study (pdf), appears to be yes - unless it's from a plantation that was established by clearing forest. The study compared total life-cycle emissions from biofuels from various sources with diesel. Fuel from canola has 49% lower emissions over its life cycle than diesel and, for a waste product such as used cooking oil, emissions can be 87% lower than diesel. However, total life-cycle emissions from biofuels derived from palm oil plantations established by clearing rainforest or swamp forest are up to 21 times higher than diesel. The problem is that some biofuels do indeed come from these sources. It has been estimated that in Malaysia nearly half of all new oil palm plantations involve deforestation, with 87% of deforestation between 1985 and 2000 due to oil palm expansion. From 1982 to 1999, about 16,000 square miles of Indonesian tropical rainforest was converted to plantation. Oil palm plantations were responsible for at least 44 percent of that rainforest loss. with growing demand for biodiesel, especially in Europe, with increasingly large suggested as well as mandatory targets, it has been observed that it is unlikely production will be able to meet future demand without the use of palm oil as a feedstock. It seems that biofuels do have the capacity to lower greenhouse emissions from transport. But whether their contribution will be good, bad or ugly depends critically on where they come from. It's true: oils ain't oils. A new paper on the potential pitfalls of interstellar trade prompts economist bloggers Tyler Cowen and Joshua Gans to look at some of the recent and not so recent economic treatises on the subject. It should be noted that, while the subject of this paper is silly, the analysis actually does make sense. This paper, then, is a serious analysis of a ridiculous subject, which is of course the opposite of what is usual in economics. An important day for climate change action? With Mike Huckabee withdrawing from the Republican party nomination race, all three remaining US presidential contenders favour strong action on climate change (albeit to varying degrees). That means - whatever happens in November - we will see a significant shift in US climate change policy in January 2009. Today is an important day for global progress on climate change.